I used to do chocolate reviews every week. I'm not sure why I stopped, because I certainly haven't stopped eating, or trying new, chocolate. Endangered Species Chocolate is not really a regular chocolate manufacturer, as you may have guessed from their name. Yes, they care about things like sustainability, good sourcing, fair trade, non-GMO, etc, but the company has taken a really amazing stance, and donated 10% of their profits to different partners helping support wildlife. They make chocolate bars in a variety of flavors, in assorted sizes, mostly regular sized bars, but they also have several individually wrapped smaller products, "Bites" (individual wrapped squares sold in resealable bags of 12), "Squares" (also individually wrapped squares sold in packages, this time of 10 and not resealable), and "Bug Bites" (individually wrapped squares sold in boxes of 64, basic flavors only. They also make flavored chocolate based spreads and barks. "Our milk and dark chocolate bars and bites are made with ethically traded, shade grown cacao and natural ingredients. Learn about at-risk species by reading the inside of each 3oz. bar wrapper. And the best part? 10% of net profits from your purchase are donated to support conservation efforts!" 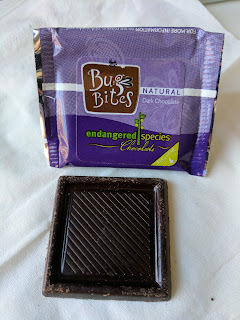 I tried two of the Bug Bites, and I was impressed by how smooth the chocolate was, some of the smoothest I've ever encountered. And shockingly, I liked the milk chocolate far more than the dark. "Milk chocolate elevated, thanks to a rich and creamy 48% cocoa content. This 64-count box contains individually-wrapped milk chocolate squares that are just right for snacking and sharing. And an added treat – each square contains a full-color info card spotlighting 15 at-risk insects! Created in collaboration with The Xerces Society, a leader in insect conservation and a past 10% GiveBack partner." I don't normally like milk chocolate all that much, but this was truly good. Super creamy, smooth, actually flavorful milk chocolate. I enjoyed it more than any other milk chocolate in recent memory. "Experience deep dark chocolate at its best with our 64-count box of Bug Bites. Each perfectly portioned rich dark chocolate square contain an added bonus – a full-color info card featuring 15 key, at-risk insects! Created in collaboration with The Xerces Society, a leader in insect conservation and a past 10% GiveBack partner." I'm normally all about dark chocolate, but I did not like this. It was smooth, and had a nice snap to it, but it was way too sweet, and the flavor wasn't complex. I don't really recall the first place I encountered Kika's Treats. It might have been at a local artisan's market. It might have been at the La Cocina kiosk in the Ferry Building. I'm really not sure, but I think I discovered Kika's Treats fairly on when they were getting started, and I've watched the product line grow and grow. Kika's Treats is a local SF company, started by a woman (nicknamed, as you might have guessed, Kika) from Brazil. She is a baker and loves chocolate, and thus started a company that makes mostly chocolate covered confections, all using local sourced ingredients. A distinguishing characteristic is that she does not use white sugar or corn syrup, and find other ways to make things sweet. And the products are gluten-free too. I believe she started as a La Cocina project, was a success story, and she now gives back 5% of all of her proceeds to the incubator. Her main products are cookies and caramels, but she also makes Brazillian cheese bread, and has experimented with a few other products along the way. You can find her goods at a few small stores around town, at the La Cocina kiosk at the Ferry Building, and on Good Eggs. "Kika's longtime love affair with chocolate-covered cookies led her to create this line. It all started with the Brazilian Honey Cakes, Kika's favorite Brazilian treat, followed by the Caramelized Graham Crackers, Kika's award-winning take on her favorite American treat, then complemented by Shortbreads, each one with a unique and delicious flavor. Try them all!" I'm not a big cookie fan, but I've still tried almost all varieties over the years. Coconut Shortbread in Pure Dark Chocolate. "Smooth dark chocolate covers a deliciously crisp coconut shortbread, made with coconut flakes and rapadura, an unrefined cane sugar with unmatched nutritional value and a unique caramel flavor. You’ll find yourself in the Tropics." The coconut shortbreads had a nice crunch when you bit in, and I liked the texture from the coconut, but the shortbread was fairly boring to me. It wasn't ... buttery enough. I did really like the coconut though. The dark chocolate coating wasn't actually that dark (64% it turns out), and I would have guessed milk chocolate if I hadn't read the packaging. I also tried the milk chocolate coated version. It again had a nice crunch, I liked the texture the coconut added, and the flavor was decent. The coconut really makes these. Milk chocolate was less exciting than dark. "Smooth dark chocolate covers a rich chocolate shortbread studded with roasted cocoa nibs, the delicious tiny pieces of crushed cocoa beans, which add an extra crunch and a subtle delicious bitterness to Kika’s least sweet Treat. Dedicated to all chocolate lovers." Chocolate three ways! Chocolate shortbread, cocoa nibs, and chocolate coated. 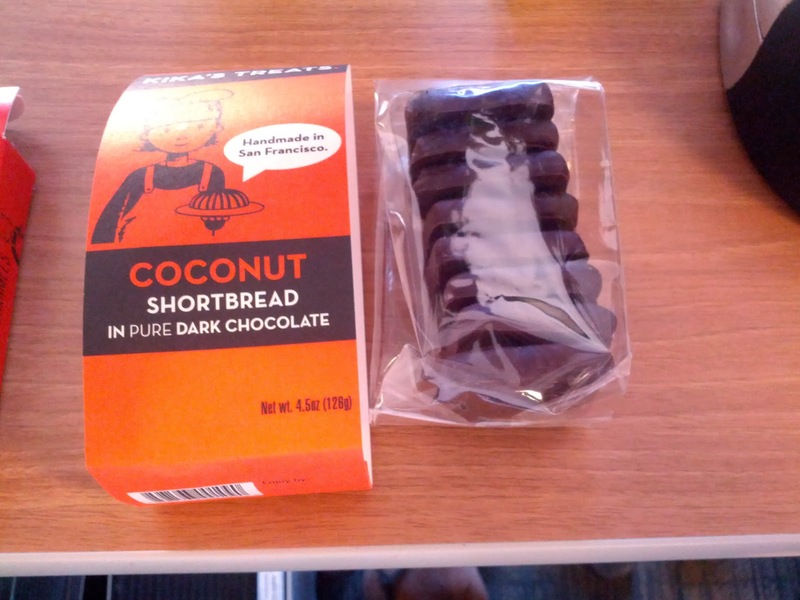 I loved the crunch from the nibs, even more than the coconut version, but the shortbread was again fairly boring, even though chocolate based. "Smooth dark chocolate covers a light, buttery shortbread flavored with coarsely ground Arabica espresso beans. Call it a Mocha Treat!" My least favorite. The nibs and coconut had added great textures to the shortbread, but the espresso just made this gritty. I did not like the mouthfeel. And again, the shortbread wasn't very buttery. I didn't like this one. "These are Kika’s most popular treats and truly addictive. Their distinctive buttery crunchiness and toffee-like flavor are unlike any other graham cracker available in the market." This isn't the most exciting sounding product, but, it was tastier than expected. The graham cracker is a nice base, and it is really, really cinnamon-y. 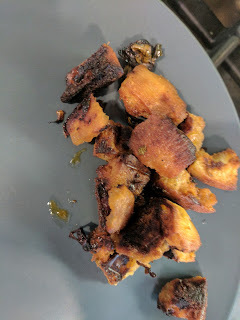 It didn't really seem "caramelized", but there was certainly something going on, and I liked the crunch, and combination of graham cracker and chocolate. Again, just a flavored graham cracker with chocolate coating, but, for what it is, it was good. And lastly, her original product! I wasn't really into it. The cake had a subtle honey flavor, and decent spicing, but overall it fell kinda flat for me. Again, just not a very interesting item. "Kika's Treats award-winning salted caramels are made with coconut palm sugar, an incredibly tasty sweetener with a natural deep caramel flavor. On top of that, it’s one of the best sweeteners around, with a low Glycemic Index and high in macronutrients. Does it get any better? Yes! We cover each one in rich, bittersweet chocolate and finish with a sprinkle of delicate flakes of sea salt. Try one and you'll never want a white sugar caramel again! Ever!" They come in two flavors, both of which I have tried. "Made with Coconut Palm Sugar, one of the best sweeteners around, these caramels have a unique and delicious deep caramel flavor. Crunchy Caramels contain Puffed Brown Rice. They are covered in pure bittersweet chocolate and sprinkled with sea salt flakes. Product does not use corn syrup and is gluten-free." These I kinda liked. It was a caramel with rice crispies in it, covered in dark chocolate. The caramel was firm, chewy, and tasty, but the rice crispies were a bit odd, they were sorta ... soggy? 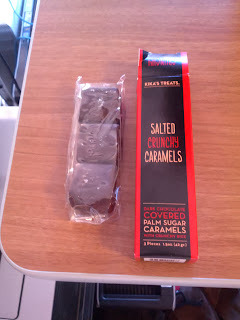 I was expecting them to be crunchy as it is the "Salted Crunchy Caramels" variety. Still, I liked the salty caramel, it had a slight burnt caramel flavor, and the chocolate notes were good too. "Made with Coconut Palm Sugar, one of the best sweeteners around, these caramels have a unique and delicious deep caramel flavor. Nutty Caramels contain roasted Oregon hazelnuts, are covered in pure bittersweet chocolate and sprinkled with sea salt flakes. Product does not use corn syrup and is gluten-free." This was similar to the Salted Crunchy Caramel, but with hazelnuts instead of rice crispies. It was again a decent caramel, firm and chewy, nice buttery flavor. The nuts did better than the rice crispies, but still were fairly lost in it. "Naturally gluten-free, Pão de Queijo is one of Brazil's best kept secrets. Kika's version has been tried and tested at events in San Francisco, and has always left people clamoring for more. Now you can be the chef and serve these fresh and hot, right out of your oven (no baking skills required). Plain or as sliders –with dry cured meats, tomato basil and olive oil– they're incredibly delicious!" My notes on this are fairly lacking, but I seemed to have not really liked it: "Kinda oily, not great cheese flavor", is all they said. These are all items that I tried at some point, but are no longer offered. Including here just for completeness. “The delicious marriage between a chocolate truffle and a caramel”. Well, I didn't like this. It was a mild chocolate caramel rolled in shredded coconut. It was not very chocolate, nor very caramel-y, and even the coconut wasn't very flavorful. It also had a strange mouthfeel. Sweet Treaty Dark Chocolate Covered Rice Cake Bites. "Crispy thin rice cakes covered in our dark chocolate, with a sprinkle of sea salt flakes. An almost guilt-free low-fat snack that will satisfy your chocolate cravings." This was pretty unexpected, although, exactly what it advertised itself as. I really liked it, and wished it wasn't discontinued. Yes, kinda just a rice cake, covered in dark chocolate. But it had a good level of saltiness, and was very munchable. It was sweet and salty, but not too sweet. 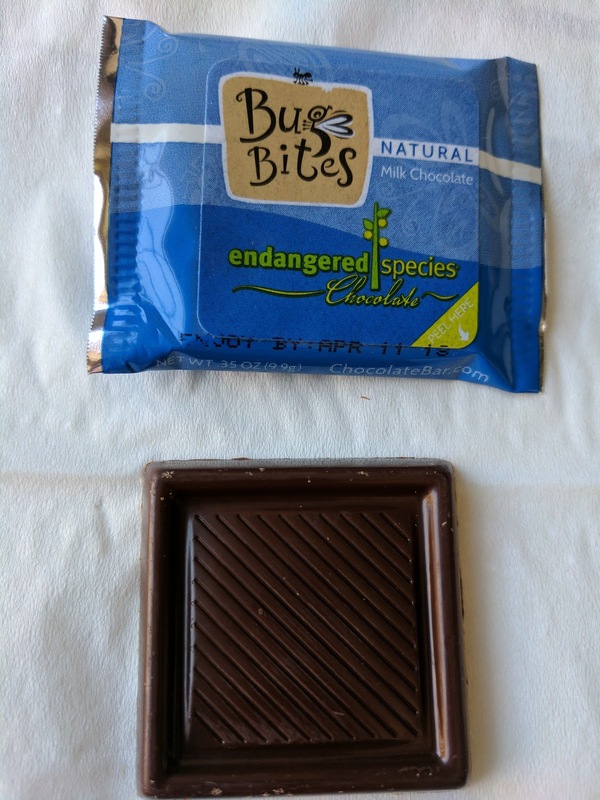 The dark chocolate seemed high quality, with a nice level of bitterness. I think I liked this partially because it felt healthy and indulgent at the same time. Sweet Treaty Dark Chocolate Covered Corn Cake Bites. "Crispy thin corn cakes covered in our dark chocolate, with a sprinkle of sea salt flakes. An almost guilt-free low-fat snack that will satisfy your chocolate cravings." This was a corn based version of the previous item. Same decent dark chocolate coating used in all the confections, wrapping a salty, crunchy, corn cake. A nice combination of salty, chocolately, and crunchy. I liked this even more than the rice cake version. San Francisco has many classic restaurants considered "institutions", one of which, no doubt, is Zuni Cafe. Zuni opened in 1979 (! ), and has quite the history (the original kitchen literally was just a toaster oven, espresso machine, and grill in a back alley!). The menu has changed a lot of the years, including many years as mostly a Mexican restaurant, but in 1987 when chef Judy Rodgers took over, things evolved, and she introduced a wood-fired brick oven. The accolades rolled in, including multiple James Beard awards (Outstanding Chef, Outstanding Restaurant, Cookbook of the Year). That brick oven led to one of Zuni's most famous dishes: roasted chicken with warm bread salad. It sounds simple, but, I assure you, this is no simple chicken and no simple salad. It remains a fixture on the menu, but one that takes a commitment - it serves two, and has a warning that it will take an hour to prepare. It will set you back $58. Yes, for chicken and a salad made of bread. I've been to Zuni, and I've had that dish. I also have friends who have painstakingly made it themselves, and can attest to how much work it. 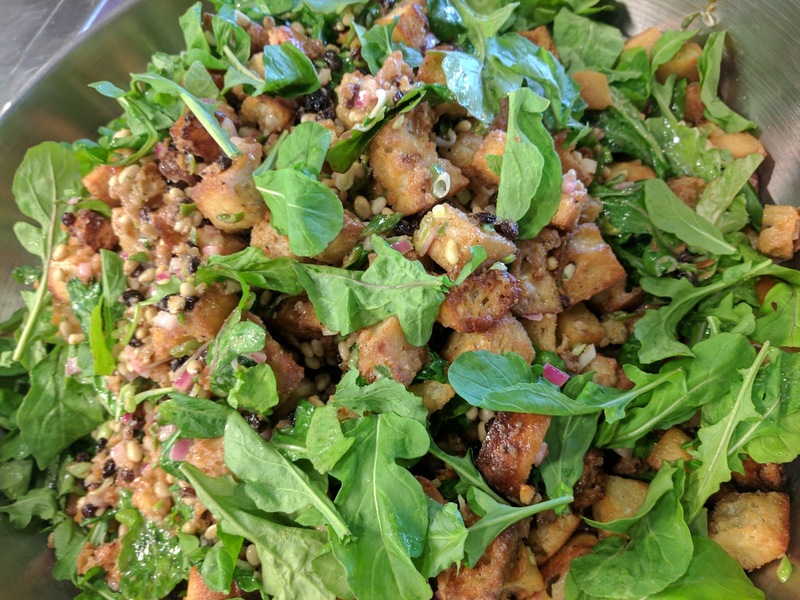 The recipe is easily available online, just Google search for "Zuni bread salad", and you can learn more than you want to about it (protip: if you want to make it yourself, Smitten Kitchen has a streamlined version ...). Where am I going with this story? Well, I had lots of bread salad leftover one day, and, I decided to do what I do with many leftovers: waffle it. If this concept is confusing, please back up, and go read my master post. To answer the big question: Leftover Bread Salad, Will It Waffle? The answer is ... not really. But it still works as a reheating technique. The Original: Bread Salad with Currants and Pine Nuts. So let me back up, to the original dish, the bread salad. My version did not come from Zuni, but, rather, it was prepared by the chefs who cater my dinners at work. They have made this, along with roast chicken, several times for us, and it is always amazing. What is it? Well, a salad with bread as the main component, yes. It sorta looks like a bowl of croutons with arugula thrown on top. Or perhaps like some too crunchy stuffing strangely topped with salad? It is chunks of focaccia, toasted first with olive oil, then drizzled with a very tangy vinaigrette with champagne vinegar, zinfandel vinegar, and mustard. Toasted pine nuts, plumped up currants, onions, and some bitter greens round out the recipe. It is served warm. I believe it normally has chicken drippings as well, but, this was a vegetarian friendly version. And, that is it. This is not just a salad with some flavorful croutons. The bread is the key component, not the greens. The arugula is just tossed on top at the end, it is the bread that makes up the body of the "salad". And those chunks of bread ... swoon. Seriously, the most flavorful crispy bits of bread ever. The flavor infused in them is just insane. They are chewy, crispy, and somewhere between a crouton and stuffing, if that makes any sense. Although I don't generally care for pine nuts nor currants, they are essential. The pine nuts provide a nutty nature and soft crunch that I can't think of suitable substitution for. I appreciate the sweetness from the currants, although I kinda wonder if perhaps cherries could work? 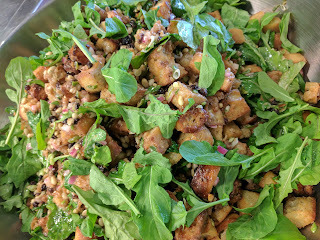 Any bitter greens will do, we usually have arugula, currently Zuni uses frilly mustard greens. Something bitter is key though, to offset the acid from the vinaigrette. And that is the bread salad. It is served warm, and something you need to consume pretty much immediately. We always have a lot left over, as my co-workers haven't quite caught on to the fact that this isn't a bowl of croutons (but once they do try it, you can bet that they rave!). I've tried several times to save it, and it kinda holds up for a day (the arugula get very wilted obviously), but, the bread quickly gets mushy, and warming it up in the oven only goes so far. By the second day, there isn't much hope for it. Rather than throw it out, I decided to give it one last valiant effort, and threw it into the waffle iron. At this point, the bread was mushy yet also chewy, a bit stale tasting, and just not holding up at all. 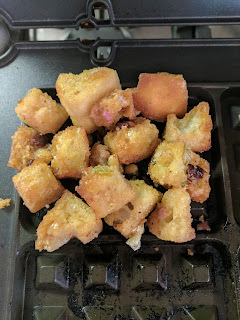 I didn't expect much, so I just threw a pile into the waffle iron, set the dial to my default 350 degrees, laughed at myself, and walked away for a few minutes. I checked in on it to find basically what you'd expect: grilled, toasted bread with waffle iron marks on it. It obviously wasn't holding together as a waffle, as I didn't provide any binding element. The Result: A Jumble of Bread Salad. After sufficient time, I wanted to remove it from the waffle iron, and realized how ridiculous this experiment was. What did I expect to happen exactly? That it would magically turn into a waffle? I know better than this. After some careful work with chopsticks (I needed something nonstick!) I was able to remove it, and dump it onto a plate. 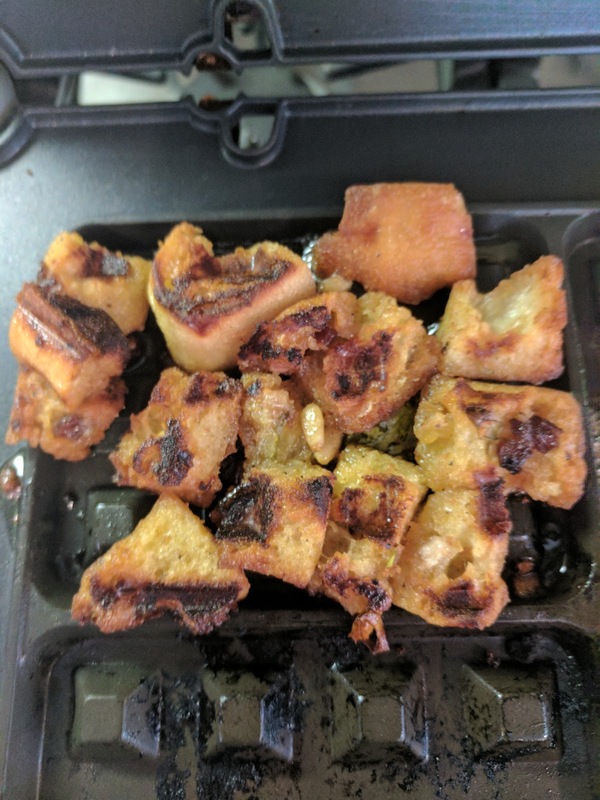 It was just a pile of toasted flavorful bread cubes. Tasty bread cubes for sure, and I liked how crispy they were, but, clearly not a waffle, and I don't think this was much different than just warming it up in the oven. So, I still ate it, it was enjoyable, but not really worth repeating. Another day, another hotel breakfast buffet. That is what it feels like to me sometimes these days. I've been doing a lot of travel. My recent adventures took me back to the Boston area, which of course you have read about many times as my family lives in the northeast and I visit several times a year. This time I was headed to New Hampshire, but not to see my family (well, not entirely). I was headed to a recruiting event, and needed to get to New Hampshire, without my family coming to pick me up as usual. The only real option (besides taking a really early flight, or driving late at night myself) was for me to fly into Boston, spend the night near the airport/bus station, and then take a bus up to New Hampshire the next day. Not exactly ideal, but it gave me a chance to check out a new SPG hotel: The Element Boston Seaport. Since this is Julie's Dining Club, not Julie's Hotel Review Club, you can guess where this review is going: breakfast. "Wake up to our complimentary signature healthy breakfast. Start the morning with hot sandwiches, refreshing smoothies, wholesome granola, fresh fruit, whole grain breads & cereals, and coffee service." I didn't really know what to expect. Sure, reviews I read of the breakfast are all enthusiastic, but, honestly, I assumed this is mostly because people are excited about *any* free breakfast buffet. I didn't think it would compare to some of the ridiculous breakfast buffets I've had at other Starwood properties, where I've had it included as part of a package, or as a Platinum benefit, like my current top three: Le Potager, Le Meridien, Munich, Le First, Westin, Paris, and Tres, SLS Hotel, Beverley Hills. And, it didn't compare to those. 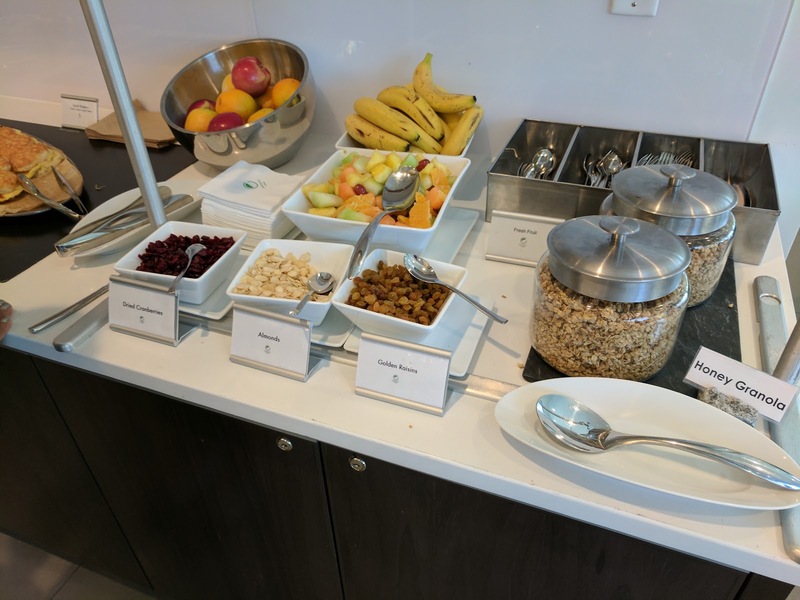 But, for an included, mostly continental breakfast buffet, it was far above average. The area was self-serve, buffet style, return as many times as you want, seat yourself, and bus your own table. 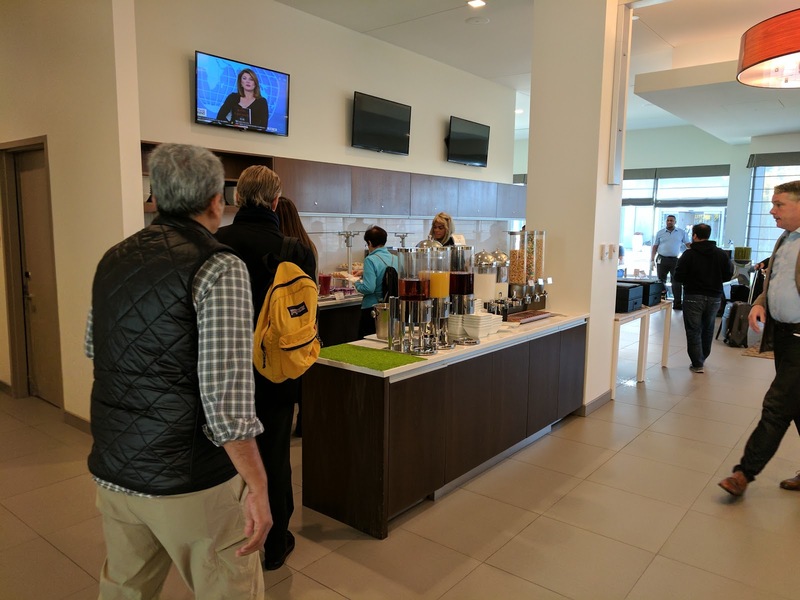 It was quite busy, with a line forming for the espresso machine all morning. The selection was good, and I do think that most people would be pretty satisfied with the offerings, even though there were no made-to-order items, no charcuterie or cheese, and very limited hot items. Element's buffet is known for 3 signature things that do set it apart for standard continental buffets: a fresh daily smoothie, good gourmet coffee, and, breakfast sandwiches, all of which I had to try. The first thing I wanted was coffee. 8am in Boston did indeed feel like 5am in my world, and I wanted, no, needed, caffeine, ASAP. Plus, I had read reviews of how good the coffee was. The first thing I encountered was a robot espresso machine. 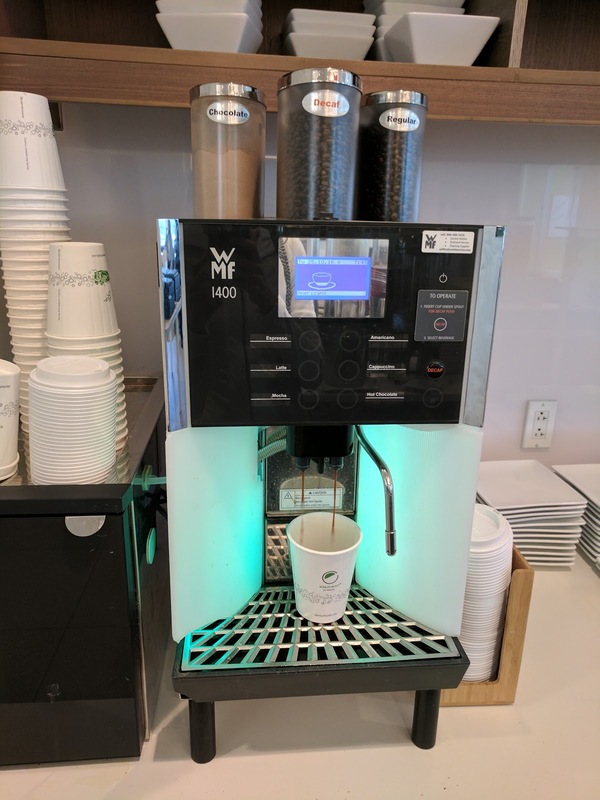 It had regular and decaf, which it would grind to order, plus regular milk to make a cappuccino. There was also a mocha option with powered chocolate. 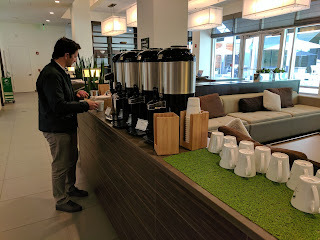 I was surprised there wasn't a big pot of brewed regular coffee available, but I didn't mind waiting a minute for some fresh ground and brewed espresso, in the form of an Americano. There were no coffee mugs nearby, only takeaway cups, which I found surprising for somewhere that is so focused on conservation. Multiple types of sweetener were available, along with several types of sugar, creamer packets, and milk (both regular and soy), which did double duty with the cereal. The coffee was indeed decent. I had a regular to start, and it was strong and exactly what I needed. I stopped by later in the day and made a decaf, and it too was really quite good, not stale tasting, no decaf funk. Neither were outstanding, but both very solid. Fresh grinding does make a difference. Only once I had gathered all my food did I see the self-serve coffee area over on the other side of the room. This area had ceramic mugs, two large dispensers of regular coffee, one decaf coffee, hot water, and assorted tea bags (Bigalow brand, including herbal, mint, and several black teas), plus the same sweeteners as the espresso area, with the addition of honey. Non-caffeinated beverage offerings included orange, apple, and cranberry juice, plus plain water and a bowl of ice. There were strangely no glasses available when I visited, and I awkwardly looked around trying to figure out what to put my water in besides a paper coffee cup. I asked a staff member if there were glasses, and he opened a cabinet and gave me one, but didn't put any others out. A few hours later, when I walked back by, there were glasses laid out. I wonder why they weren't there earlier? Maybe there should have been coffee mugs near the robot machine too? The final beverage was a smoothie, the other item I had read much about. I'm not one for smoothies, but, if everyone raved about it, it was worth trying, right? It was in a pitcher in the well with cold foods, so I was able to take just a tiny bit and not waste. I didn't like it, but, well, it was a smoothie. Thick, yogurty, meh. Element prides themselves on the fact that the breakfast offerings are not just continental. 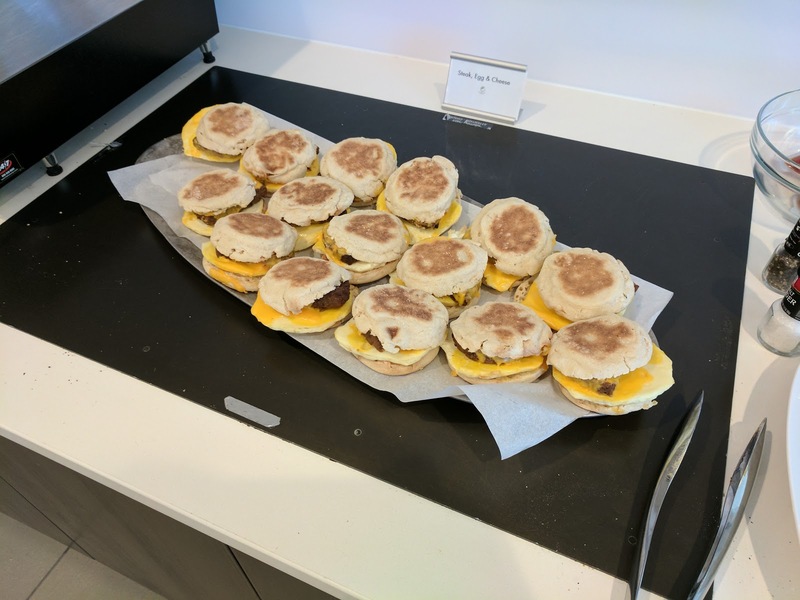 They always feature breakfast sandwiches, which you can tell are crowd pleasers (likely more out of novelty than anything else?) I can't tell you how many reviews that I saw mentioned the breakfast sandwiches. These change regularly, and I believe always include one vegetarian option. They also had two chafing dishes with hot foods that I failed to get a photo of. One was scrambled eggs that looked very dried out, and the other was bacon (actually crispy looking). I don't really like eggs so those were easy to skip, but I did almost take a slice of bacon. I'm not sure if these items rotate with other things like sausage or pancakes, as I was only a guest for one night. Beside the hot foods were condiments, adorable packages of ketchup (far bigger than standard McDonald's packets, so you might actually only need one!) and hot sauce, plus salt and pepper grinders. These little touches do set the Element apart. South Western Breakfast Sandwich: Onions, Peppers, Egg, & Cheese (Vegetarian). I know I don't like eggs, and why would I want a pre-made breakfast sandwich that was just sitting on a hot plate? Yeah, yeah, I should know better. 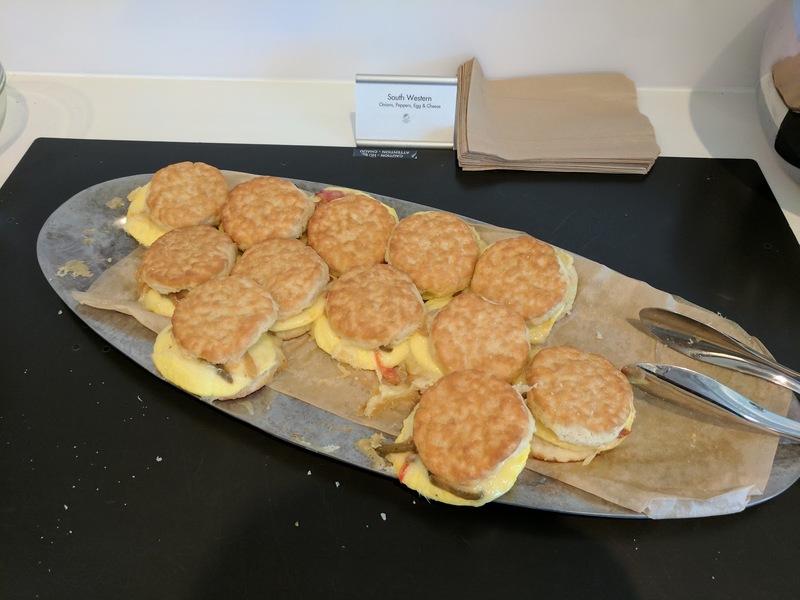 But, these sandwiches used biscuits as the base, and biscuits weren't available plain. I figured that worst case I'd salvage the biscuit and spread it with butter (or honey + butter = honey butter), or perhaps some jam. This was about as you'd expect, a pre-made, but well made, breakfast sandwich. The cheese on top was congealed, but quite tasty, some kind of white cheese. The egg patty was actually really fluffy and nicely done, and I liked the spicy peppers on top. I didn't see any onions. The biscuit itself was the weakest part though, just kinda soggy, no real crumble to it, no tang. I didn't feel the urge to try to save it, and instead actually ate more of the filling. Overall, not great, but, better than I'd expect. I didn't try the other option, steak, egg, and cheese on english muffin, but, the two people I saw take these didn't finish them, if that indicates anything. 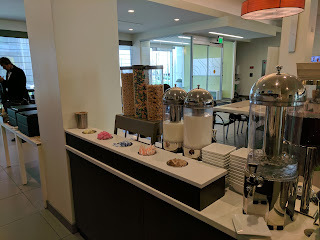 The majority of the buffet is continental offerings. 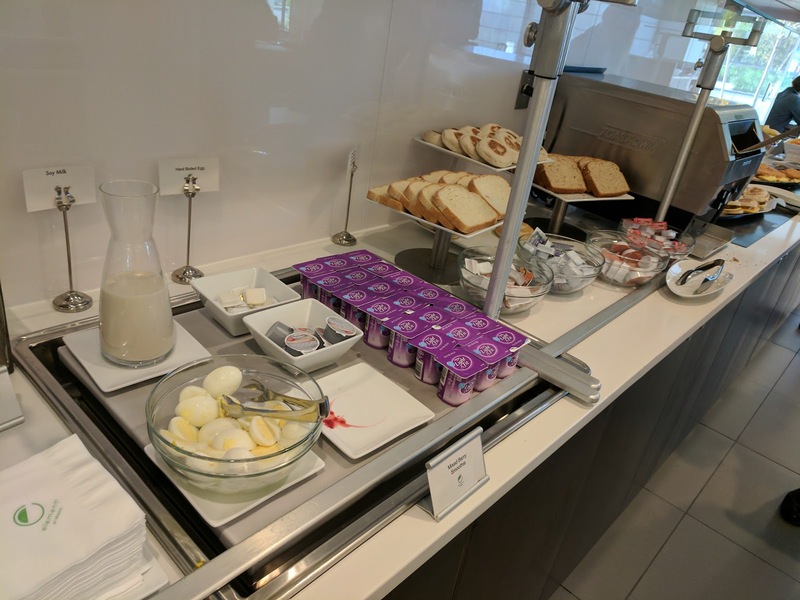 The continental section started with a cold well with hardboiled eggs and individual packages of Dannon Lite & Fit flavored yogurts, a small pitcher of soy milk, butter, and cream cheese (Philadelphia, vegetable only, no plain). Next was bread (white and wheat), english muffins, and bagels (plain), with a toaster on the side. Besides the cream cheese, there was also smooth peanut butter (Kraft?) and Smucker's brand jams (strawberry, orange marmalade, and grape). Cereal & Milk (backside), Sugar and Sweetener (front). Finally, there was fruit (whole apples, orange, and bananas), a fruit salad, and dried raisins and cranberries, plus two types of granola. I tried both granolas with soy milk, and enjoyed those too. I'm not sure what brand or kind they were, as they were unlabelled. 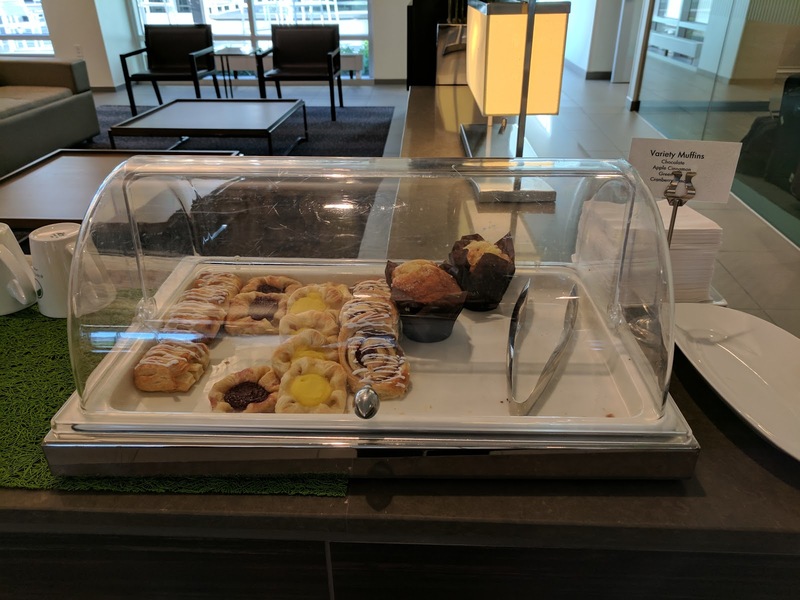 Over on the other side of the area, next to the self-serve coffee, was a plastic case with baked goods. It seemed far less popular than the other areas, and I'll admit, buffet pastries are rarely good. Of course the yogurt, cereal, and bagels are safer choices. Or more likely, people just didn't see it, as I only found it because I was seeking out baked goods. They all missed out. The baked goods were shockingly good, particularly for a buffet, and particularly for this level of buffet. 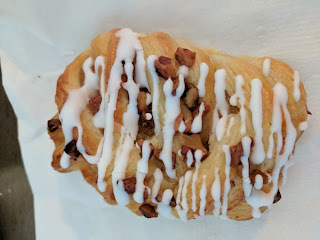 The pastry case contained filled danishes of assorted varieties (custard, berry, apple, pecan), cinnamon rolls, and muffins. Only the muffins had a label, and none looked that great, based on visuals alone. Still, you know me, I love baked goods. I obviously was going to try at least one. I took a cinnamon roll, as it looked most promising. It was soft, sweet, and had a great amount of cinnamon between the layers. Only a little icing on top, but just the right amount to not make it too sweet. I was surprised by how much I enjoyed it, and would gladly have another. "Our Lemon Cranberry muffin is made with lemon puree, real cranberries, buttermilk and eggs. It's filled with a creamy lemon curd and topped with butter lemon streusel." Next, I moved on to muffins. The sign said that they had Chocolate, Apple Cinnamon, Green Tea, and Cranberry Lemon. There were two chocolate muffins when I arrived, but, the person before me, somewhat apologetically, took both. Clearly the appealing item, chocolate base with huge chocolate chunks. I didn't see any that seemed like they could possibly be described as green tea. 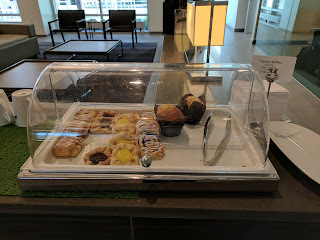 I did my research, and learned that the muffins came from US Foods Chef's Line. First, I went for the streusel topped muffin, which turned out to be cranberry with ... some kind of custard in the top center? Certainly a strange combination, but I really quite enjoyed it. The muffin was moist, the cranberries provided a nice tang, and I did like the creamy custard, as strange as it was. 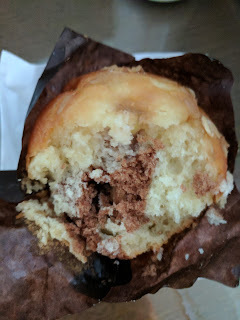 The crumbly streusel on top, which is what drew me in, was fine, but, the least exciting part of the muffin, as there just wasn't much of it. Next to me, another women had an egg sandwich, and discarded it after a bite or two. Then she had some scrambled eggs, and again, pushed them away. She told her dining companion that nothing was good, but she was hungry. He suggested a muffin, and she rather begrudgingly got one. One bite in, she admitted that it was really good. I wasn't the only muffin fan. According to the sign, the one I took was Cranberry Lemon, or Lemon Cranberry per the manufacturer, but I dub it the "Cranberry Custard Streusel Muffin". Apple Cinnamon Gourmet Muffin with Apple Filling. "Our apple cinnamon muffin is filled with delicious Michigan Rome apples topped with a crumbly streusel." 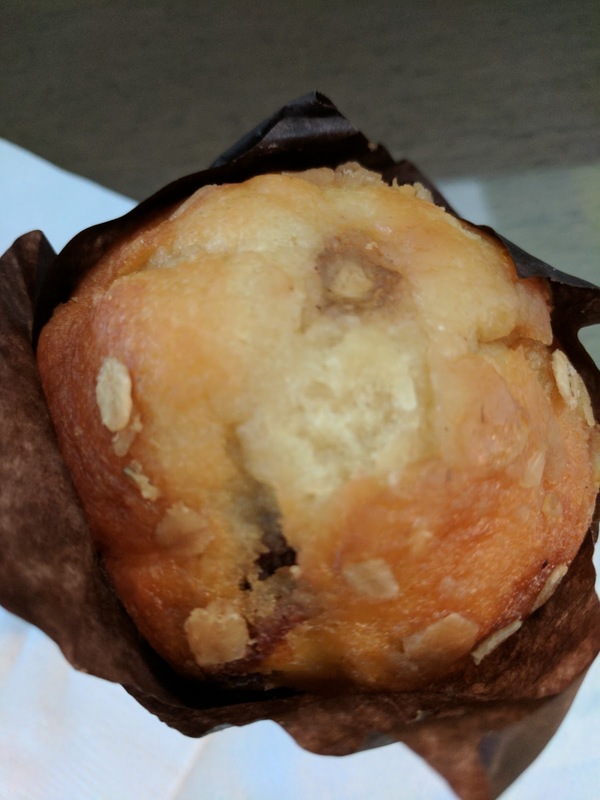 After the success of the first muffin, I went for another, for the road (aka ... an hour later), totally unsure of what kind it was. It had a few scattered oats on top, and a pocket of something that looked like it might be caramel (it wasn't). Apple Cinnamon Gourmet Muffin with Apple Filling: Inside. It turned out to be the apple cinnamon. Inside the muffin was brown core, I guess "cinnamon", but not particularly cinnamon-y. This part was a bit dry. Down the top center, much like the custard from the cranberry muffin, was a filling, this time, apple cinnamon. It was half goo, half little chunks of apple. The apple was nicely cooked, the spicing was good, but I don't really care for apple. 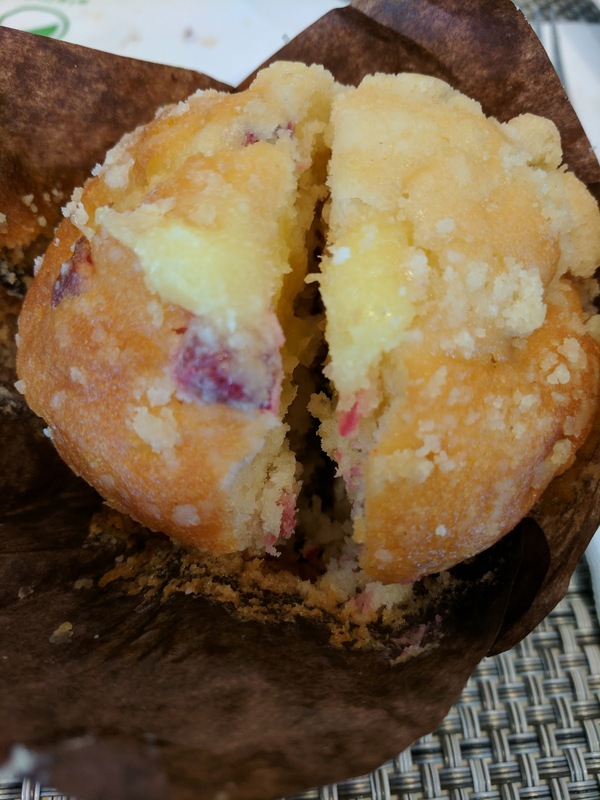 The rest of the muffin seemed to be the same base as the cranberry, moist, and pretty good. The topping here was oats, just a tiny scattering, even fewer than the streusel from the previous muffin. I didn't really like this one, but that is just due to the flavor. It was still moist, and I still loved the top part that wasn't touching the apple filling. And ... when I went back downstairs later, the pastries were still out even though breakfast had ended. I couldn't stop myself, I helped myself to another. It was the best of the bunch. This turned out to be ... pecan pie-in-a-danish. The filling was the sweet goo that makes pecan pie oh-so-delectable. The pastry was flaky and crispy. It was drizzled with sweet white icing and topped with little bits of pecan. I loved it, and it reminded me of the one I had at the Hyatt Regency in Buffalo. Very sweet though, but, really, if you love pecan pie like I do, and you love pastry, this is a thing of wonder. Yeah, yeah, yeah, Buca di Beppo. Large format, family style, chain restaurant, Americanized Italian, yadda, yadda, yadda, but, really, it isn't *that* bad. Ok, their signs are bad. As is the cheesy "Italian" music blasting out onto the side. And, granted, I've only been to Buca di Beppo a couple times. The first time was a rehearsal dinner for a wedding in Seattle, and the only thing I really remember is that Ojan loved the baked ziti. Or was it the ravioli? I don't recall anything noteworthy myself, besides, well, the massive scale of everything. 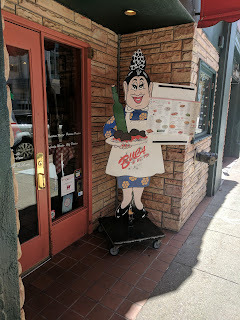 A few years later, Ojan threw me a surprise birthday party at the Buca in San Francisco. I can't confirm it, but, I kinda think this was a case of rather late planning, and, where else can easily handle a large group? Again, I don't recall much about the food, but, I did think it made a decent enough venue for our large and rowdy group, and, I recall liking the garlic bread. I've also had Buca di Beppo catering a few times, and again, recall thinking the caesar salad and fettuccine alfredo weren't bad. Ojan likes the chocolate chip cookies. My general impression has always been that the place is decent enough, for what it is, except of course, the brownie sundae, which I've just never liked. 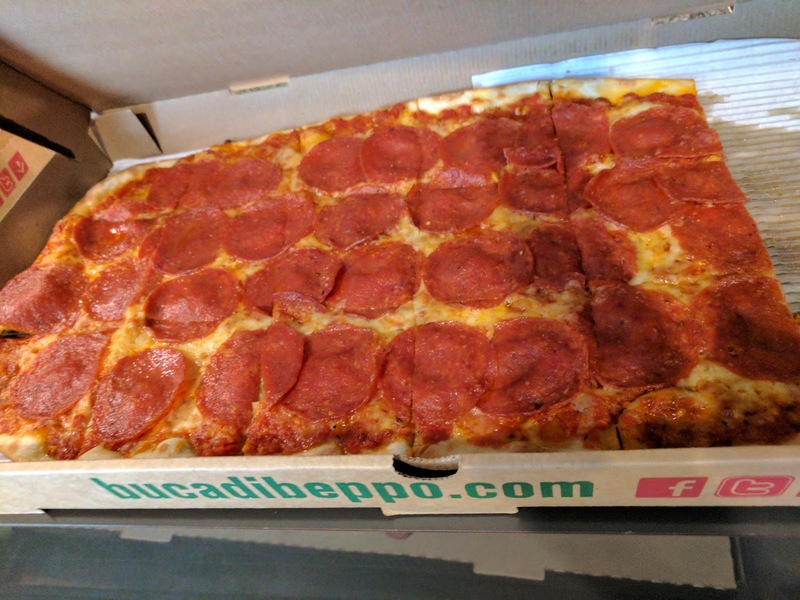 Fast forward to 2017, and now that I have a blog, I decided to pay attention when my apartment building hosted a party and had pizza from Buca di Beppo. It was delivery, and, certainly suffered in transit. To call it lukewarm would be generous. 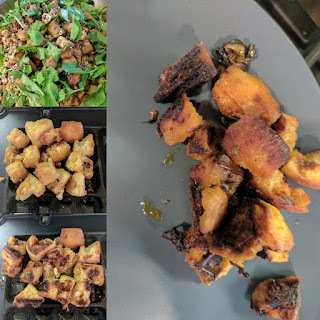 I wanted to rush a slice up to my apartment to warm it up in the toaster oven, but, I felt a bit guilty running out of the party, just to provide myself tastier food. So I stayed, and ate lukewarm pizza. Pizza con Formaggio, Large. $29.99. "Mozzarella, garlic-infused olive oil and our authentic pizza sauce." I laughed when I looked up the cheese pizza online: "pizza con formaggio", it read. Really, Buca? Nothing else on the menu sounds pretentious, why the simple cheese pizza? I laughed further as I copied over the description: "our authentic pizza sauce". Oh, really? Authentic what exactly? It was decent pizza though. Not fancy artisanal pizza cooked in a 900 degree oven. Not made with flour imported from Italy, the finest tomatoes, or house made mozzarella. But, for simple pizza? It was good. The crust was thin crust, and nicely crispy. The sauce was fine, not too sweet, not too tangy, nothing strange going on there. Cheese well distributed and melted. Did I taste the garlic infused olive oil? Well, no. Did the sauce taste "authentic"? I have no idea what that even means, really. But the pizza was fine, just, not special. 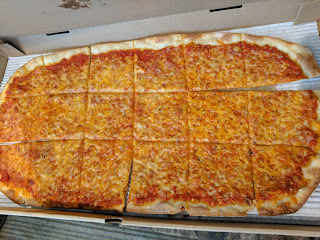 We had large size pizzas, oblong, with 18 slices, designed to feed 5 people according to the web site. 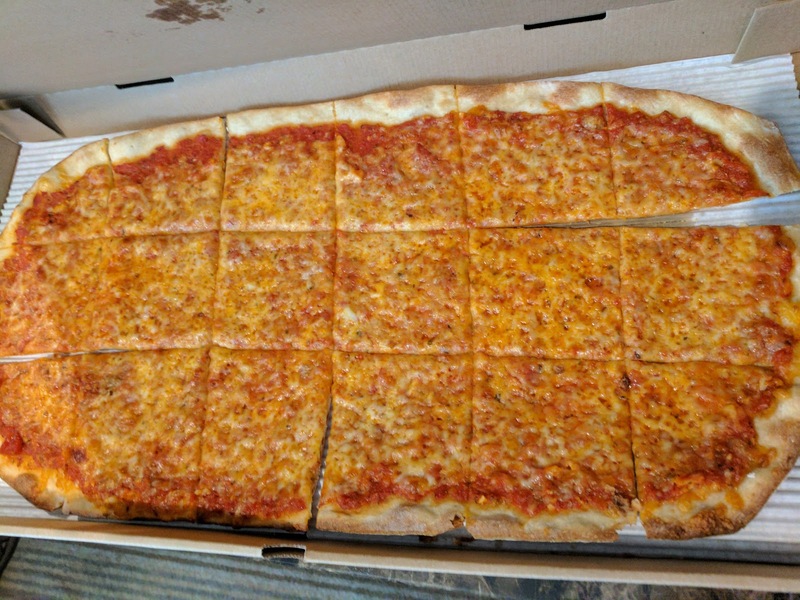 "Large slices of pepperoni, mozzarella, provolone and our authentic pizza sauce." We also had pepperoni. I didn't try the pizza itself, assuming the base was the same as the cheese pizza (but, it wasn't? According to the description, no garlic infused olive oil on this one, and, provolone cheese too? ), but I did steal a giant pepperoni off of one of Ojan's slices. Because, really, how do you resist those insanely large slices? #theBucaWay. The pepperoni too was, well, fine. Sorry this review is so boring, but, there just isn't much more to say. Ojan did like the pizza, and commented on how it was better than he expected. Buca di Beppo is solid, reliable, and won't leave anyone unhappy, they just probably also won't remember it either.